All of Naruto Shippuden fillers list – Naruto Shippuden is an anime series adapted from manga created by Masashi Kishimoto. It serves as Part II after the original Naruto anime. It covers story after two-and-a-half years timeskip. Naruto Shippuden follow story of Naruto Uzumaki who want to bring back his friend, Sasuke Uchiha who defect to Orochimaru while also fighting crime organization group named Akatsuki. Naruto: Shippuden developed by Pierrot Studio and directed by Hayato Date. There are total 500 episodes in Naruto Shippuden covering several important story arc in manga such as Kazekage Rescue Mission arc, Tenchi Bridge Mission arc, Itachi Pursuit Mission arc, Pain’s Assault arc, Five Kage Summit arc and Fourth Shinobi World War arc. 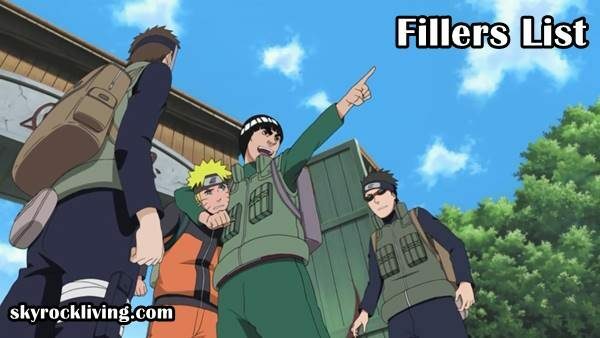 One of the most common problem for anime watchers is filler episode. As we know that each episode of Naruto Shippuden is either canon or non-canon (filler). Canon is the original material that was stated by the writer in their work. While non-canon or filler is additional scene or episode create specifically for anime. So why filler exist in the first place? Filler were added to prevent the anime from catching up with the manga. In other word, filler just additional story which there is no correlation or importance to Naruto main story (canon). So none of the fillers have any connections to the canon storyline and you can skip it. But in fact, there are many fillers in Naruto Shippuden. There are total 221 Naruto Shippuden filler episodes, covers up to 44 percent of all episodes. This numbers is indeed, very high. It’s common sense that many Naruto fans that annoyed by those filler episodes. So how to watch Naruto Shippuden without filler episode? In order to avoid filler, here are list of fillers in Naruto Shippuden from first episode to present episode. This is the first main filler episode in Naruto Shippuden. It actually start at episode 54, but it still cover canon material. The all-filler episode covers episodes 57 to 71. This arc actually is pretty good and expand upon Twelve Guardian Ninja and introduction of Sora. We also got more detail about Asuma’s past and expand Naruto’s wind element training. The second major arc is usually called Three-Tails Arc (Sanbi Arc). It covers episodes 90 to 112. The first three episodes and the last one also content canon material. This arc will give more detail about Three-Tails background, from its whereabouts and how Akatsuki later can captured it. It also tell story about Guren and her team. This arc, Six-Tails Unleashed arc ,will covers from episodes 144 to 151. It tells story aboutu Jinchuriki host named Utakata and his student named Haru. We know what happened in the end – Pain capture Six-Tails. Recommendation : This arc timing is very bad – just after Jiraiya’s death. I don’t know why they made this, since it’s give stall time about Jiraiya’s death news to Naruto and co. You can skip it. It very strange this two filler episodes come into the middle of Naruto and Nagato last showdown. Very bad timing for filler episodes. Recommendation : Honestly, this filler is so funny and bring back memories from original Naruto (it’s used original Naruto theme song too). If you want to have laugh, maybe you can give a time. This arc is officially named Past Arc: The Locus of Konoha. It tell flashback story of several secondary characters in Naruto Shippuden. Paradise Life on Boat filler arc cover from episodes 223 to 242. This arc shows Naruto and his team – Gai Maito, Aoba Yamashiro, Yamato – on their journey to the Land of Lightning by sea. Recommendation : There are several funny moment in this filler arc, but since it takes many episode you should probably just skip it. Four stand-alone filler from episode 257 to 260 titled ‘Meeting’, ‘Rivals’, ‘Rift’ and ‘Parting’. A special Naruto filler arc with looking good grand design. It covers 6 episodes and tell story of Team Kakashi that was sent to mission to investigate the massacre of Tonika Village by Kabuto Yakushi. We also can see reincarnated Hidan too (how could that possible?). There are tons of filler in the middle of Fourth Shinobi War arc. If you are not manga reader, you probably think that all of them were cannon. Some of them actually good since we can see other fight not show in manga. It also add character development of some minor character such as Omoi, Pakura, Maki, Torune, Deidara, Kurotsuchi, Hayate, Seven Swordsman of the Mist, Sound Four among others. Recommendation : There are several Naruto filler episode worth watching in this arc, probably at episodes 280, 284, 285, 286, 287, 288, 289, 303-305, 316, 317, 319 and 320. This arc – namely Kakashi’s Anbu arc – covers episodes 347 to 361. It’s pretty weird arc, since it begin on Obito Uchiha background and origins of Akatsuki and end up to Kakashi’s background. To add more, it also tell story of Yamato and Itachi flashback. This arc actually look promising since it tell story about Chunnin Exam arc in between the timeskip. I expect how the Konoha 11 (minus Naruto and Shikamaru) growing their ability and got their chunnin status. But it’s not meet my expection. The idea to add filler story within Infinite Tsukuyomi actually is pretty good idea, but also if it perfectly executed. Instead, they just make another absurd story that involve Naruto and Sasuke. They even make 2 special episode for Tenten. This arc focus on Itachi through his light and darkness life. It actually pretty good arc in Naruto Shippuden, some fans say it the best Naruto fillers arc worth watching. We can see Itachi story depth. We even see Shishui Uchiha in action too. A fascinating arc about the early world of shinobi. From the birth of Kaguya to the era of Hagoromo and Hamura, we end up to the story of Ashura & Indra. Don’t know what’s the point to create one episode, consist childhood story of two characters with irrevelant impact to the storyline, past or present. Recommendation : You can watch it, only if you want to see more childhood story from Naruto, Hinata, Sasuke, Sakura, Gaara, Shikamaru, Jiraiya and Kakashi. Those are our Naruto filler list guide, so you can watch Naruto Shippuden anime without suffering to watch the filler story. We agree that filler episode is very annoying. So you just skip it to save your time.